Two weeks ago we announced that the Council of Worlds was going to battle over the cover-up, as this is interfering with the Earth as a schoolhouse. People have a right to know what is pending, so they can make spiritual decisions. 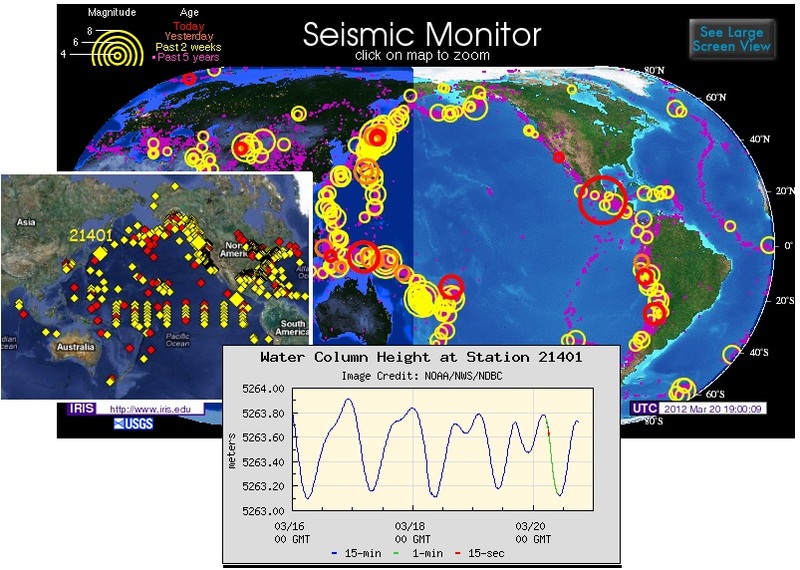 For this reason, the Council allowed the pace of the 7 of 10 scenarios to be held back (although the ultimate timeline does not change), and are using such devices as humming and glowing boxes along fault lines to hold back the plate movements, as reported on February 26, 2012 in Issue282 of this newsletter. In response, the establishment tried to take down the ZetaTalk website along with all its Mirror Sites, as detailed on March 18, 2012 in Issue285 of this newsletter. ZetaTalk Announcement 3/3/2012: What is likely to shock the world is the drama being contemplated by the Council of Worlds, in their current battle with the cover-up. This will be something that the establishment has not guarded against, not even contemplated. This will be a series of signs to mankind that even the common man has not contemplated. Now the Council of Worlds has countered with a maneuver that seemed, as the Zetas had predicted, unimaginable. For a period of 30 hours, the satellites measuring the Earth’s magnetosphere reported that the magnetic blast, normally coming from the direction of the Sun, had reversed. This was recorded on both the ISWA satellite and the NICT Magnetic Simulator. Thought the establishment quickly deleted all the evidence, during the 30 hours many in the public sector noted this phenomena and made copies of the data. Too late, the secret was out, and the establishment had no explanation for what had occurred. For all the details, visit the Pole Shift ning blog dedicated to this issue. Per the Zetas, their spaceships caused the satellites to record a reversal, which affected the Earth in no other way. The cover-up was the target, and the cover-up took a hit. ZetaTalk Explanation 3/24/2012: For 30 hours the Earth appeared to be bombarded with magnetons coming from a direction other than the Sun. Normally what is described as a bowshock appears on magnetic simulators, showing this flow coming from the right, from the Sun. But from 14:00 UTC on March 12th to 21:00 UTC on March 13th, this reversed. Note that the Earth’s magnetosphere did not reverse. It was only the direction of bombardment that reversed. Since Planet X is still sunside, still between the Earth and Sun, what caused this reversed flow? Why should a large quake near Acapulco cause buoy 21401 off Japan to go on alert, as well as buoy 46419 off coast of Oregon to go on alert? One would expect buoy 43413 near Acapulco to be on alert, which it was. All of this of course is being caused by plate movements, per the Zetas 7 of 10 scenarios. The massive quake sent broken tiles and pieces of buildings falling onto sidewalks as far away as Mexico City, about 200 miles (320 km) from the epicenter. This quake is precisely on the 3-way point where the Cocos, N American, and Caribbean plates meet. As S America rolls its top to the west, the Caribbean Plate is pushed over the Cocos Plate and the tip of the N American Plate at Mexico is pulled to the west. As the Caribbean Plate is pushed down, Central America crumbles. The northern edge of the Caribbean Plate cuts through the Dominican Republic, and sure enough, right on the border in Mabrigida Community farmers report that their land is sinking and tearing apart. They asked government authorities to investigate what is happening on their properties located in the community Mabrígida, said some farmers are reluctant to go to their farms for fear that it swallows the earth by agricultural plantations that remain. And as the great continent of S America is pulled to the west, it too is stretched. If S America is an ice cream cone, the ice cream piled at the top pulls more readily to the west, as the Cocos and Caribbean plates are small and thus easily pushed around. The cone, whose tip points to Antarctica, butts up against the larger Nazca Plate, which resists and forces the spine of the Andes up and over the edge of the Nazca Plate. As the ice cream top lobs over toward the west, S America is pulled into a stretch, which can be seen in the large crevasses that have opened up across the continent, a point well made in this Pole Shift ning blog. In Araraquara, Sao Paolo, in the weekend opened a crater on avenue Alberto Santos Dumont, which provides access to the city airport. 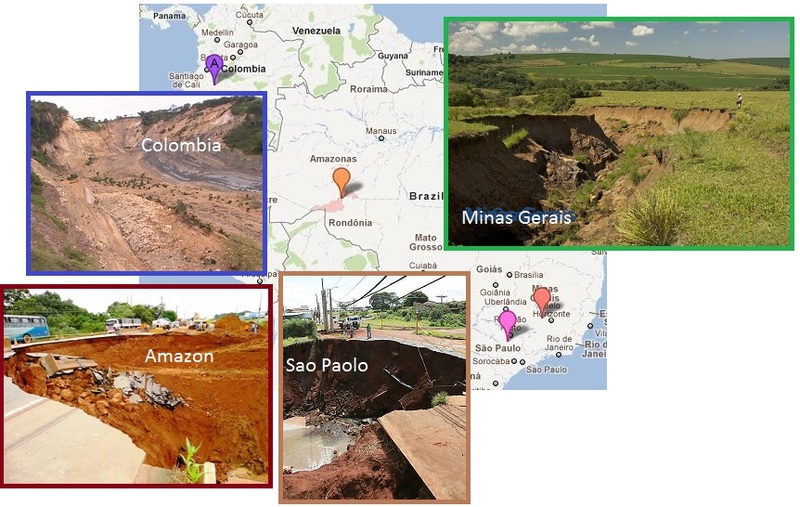 The crater, which opened in the middle of Highway BR-364, damaged both lanes and blocked the only access to the city of Porto Velho from other regions of the country. Began to appear cracks, and the earth keeps moving. Locals watch the daily on mountains earth movement. They hear any sounds emanating from the depths of the earth. Stretch zone noises have come to Wisconsin, as they were destined to do. Wisconsin will rip apart as the Seaway pulls apart, and it is already giving evidence of that. A Green Bay hum was reported on July 23, 2008, as outlined in Issue 089 of this newsletter. A hum just above Detroit at Kincardine, Ontario was reported on August 7, 2008, as detailed in Issue 091 of this newsletter. A crevasse in upper Michigan appeared on October 5, 2010, as outlined in Issue 207 of this newsletter. Now popping noises and shuttering and vibrations have come to Clintonville and nearby Montello in central Wisconsin. Workers peered into manhole covers and utility crews tested for leaking natural gas and other problems, but no one has yet to find anything amiss. Absent any better explanations for the sounds and sensations that have, well, rattled, the town, residents were left to their own devices to come up with explanations. The mystery is even stumping some of the brightest minds at the University of Wisconsin, who were consulted about whether or not these booms could be related to seismic activity. The city has so far managed to rule out problems with the water and sewer system, elevated gas levels, area blasting or mining, industrial businesses, and even military operations. Police in Montello are investigating reports of booming sounds similar to what's been reported in Clintonville this week. One person even described it like a really bad train wreck, all the cars slamming into each other at once, right where you're standing. The towns of Clintonville and Montello are both just to the west of the “Prairie du Chien Group —dolomite with some sandstone and shale” per the Wisconsin Geological Survey. This rock is apparently strong enough to resist being pulled apart, which puts the stress to the west into rock strata that is sandstone. Both Clintonville and Montello are along rivers too, which are weak points in the crust, drooping down because the crust is thin in those places. 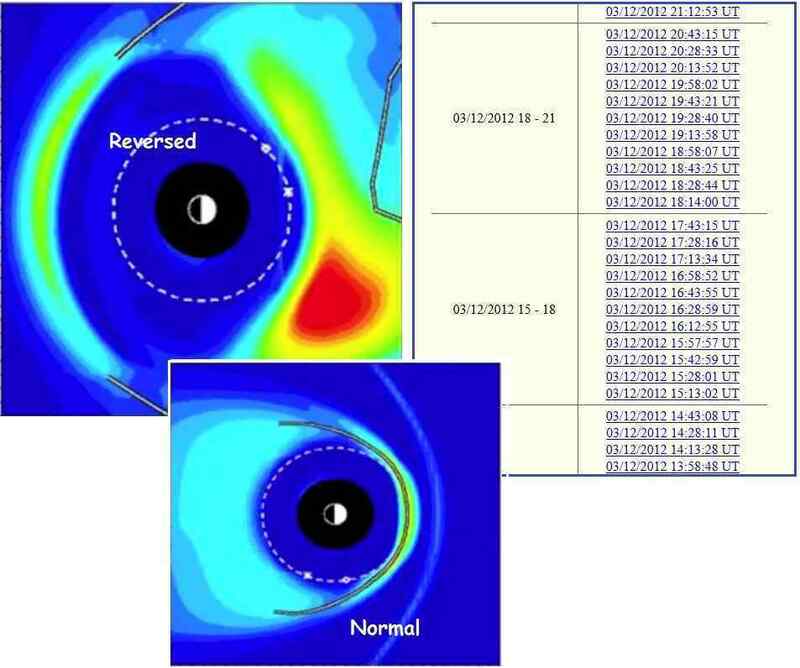 Per the Zetas, it is no surprise that investigators can find no reason for the noise and shaking as the truth about the nearby presence of Planet X is being suppressed. 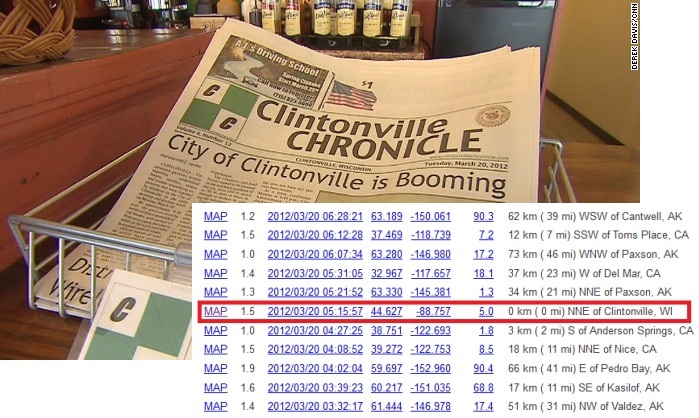 However, the USGS gave it a try, claiming that Clintonville’s nightly banging and shaking were due to a mere magnitude 1.5 earthquake that occurring on the first night. This apparently explains why the noise and vibrations only occur at night, and continue unabated. Residents complained of loud booms and shaking houses for the fifth consecutive day, but the calls are dwindling in number as seismic activity declines. The U.S. Geological Survey reported that a 1.5 magnitude earthquake was recorded beneath this Waupaca County city at 12:15 a.m. Tuesday. That likely was the largest disturbance among "a swarm of several small earthquakes" that has been shaking the city all week, geologists said. The 1.5 tremor is only the second recorded earthquake in Wisconsin since 1947, according to USGS geophysicist Paul Caruso. 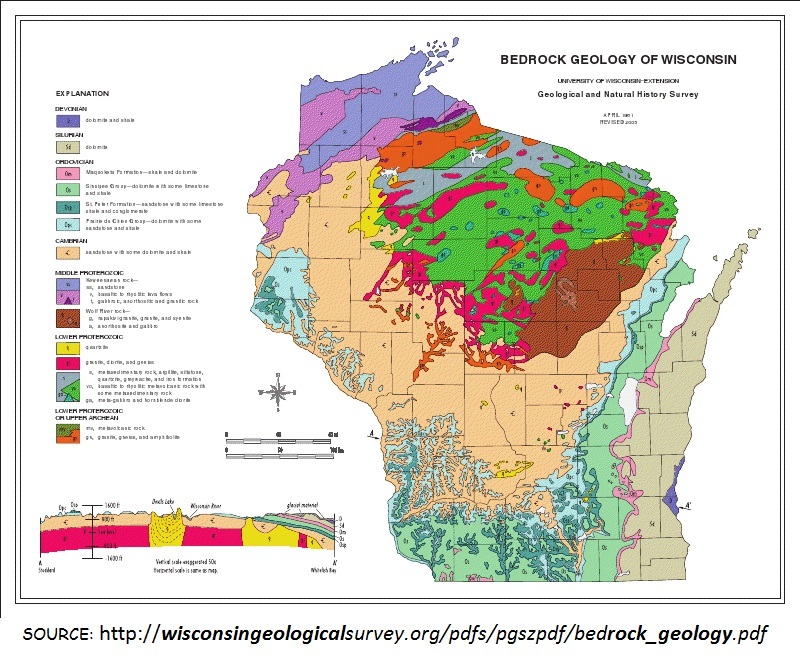 The rock underneath Wisconsin and in much of the country east of the Rocky Mountains is "very consolidated" and without fault lines. And that means small quakes are actually felt by residents. Some Clintonville residents were even holding "shake" parties at night, waiting for the rumbling. ZetaTalk Comment 3/24/2012: Stretch zone incidents - where rock pulls apart or snaps, creating booms and vibrations and hums, dropping bridges that lose their moorings or snapping gas and water mains, or creating sinkholes or crevasses - are not considered earthquake incidents. Quakes occur when rock borders slide along each other or push under one another, creating a jolt or a series of jolts. Stretch zone accidents only happen when major plate movement is occurring, and are usually silent so do not get the attention that jolting earthquakes get. A bridge slips off its mooring and is attributed to heavy trucks or poor construction. A sinkhole appears and is attributed to ground water erosion. A building implodes and is attributed to settling, even though the building may have been there for centuries. What’s a Stock Market guy to do when the Zetas are advising the public to cash out, buy chickens and goats and seed, and forsake paper money? Since they cannot directly address the ZetaTalk predictions and the obvious Earth changes without running amuck of the cover-up over the presence of Planet X, they must be sneaky. Ameritrade’s latest commercial tries to ridicule the Zeta prediction of a pending pole shift by association. Rotation stoppage does not cause things to float off the face of the Earth, nor have the Zetas espoused the December 21, 2012 date as the end of the Mayan Calendar, nor have the Zetas said that time would stop when the pole shift occurs. Yet this is implied. 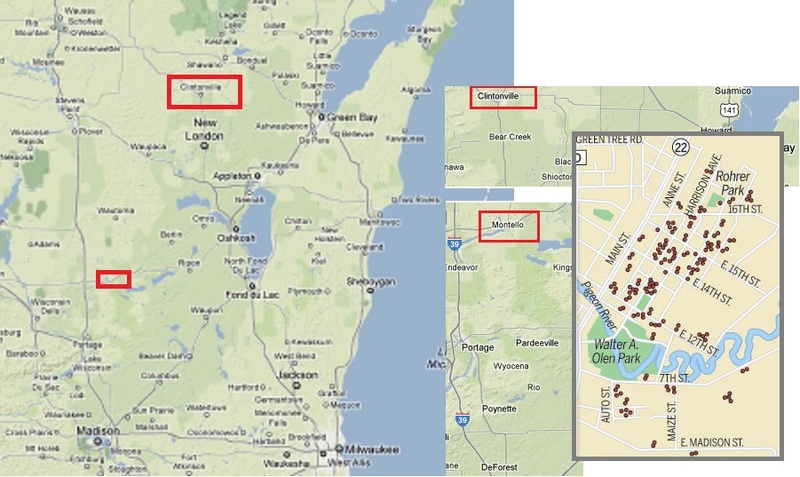 ZetaTalk Comment 3/17/2012: Will this commercial bring business for Ameritrade? Those promoting it hope it will counter the urge to follow our advice, for the public to put their funds into gardens and flocks and herds, forsaking the Stock Markets. We have advised that paper money in all its forms will become worthless, the barter system replacing this. This commercial is attempting to ridicule our predictions, tying the concept of a Pole Shift to the misconception about how gravity will operate during a passage. And now that it is presumed that a Pole Shift will not occur during 2012, given the slow start to the 7 of 10 scenarios, it is safe, so they hope, to burry our warnings along with the Mayan Calendar hype. If Wall Street is trying to urge you to invest, despite the Pole Shift hype, elsewhere around the world mountain top safety is being considered. In Brazil, the mayor of Sao Francisco de Paula is advertising his town, some 900 meters above sea level. Mayor of Sao Francisco de Paula in Brazil has launched a campaign to urge his fellow citizens to prepare for the end of the world, which, according to the Mayan calendar, will happen on December 21, 2012. Decio Colla believes that his town located 900 meters above the sea level may become a safe haven to those afraid of floods and giant tsunamis. The mayor advised citizens to keep enough drinking water and food at home in case a natural catastrophe takes place. On famous Mount Bugarach in France, the public is not waiting to be invited. They are arriving in droves well ahead of the anticipated December 21, 2012 end of the Mayan Calendar. For decades, there has been a belief that Pic de Bugarach, which, at 1,230 metres, is the highest in the Corbières mountain range, possesses an eery power. Since the 1960s, it has attracted New Agers, who insist that it emits special magnetic waves. Upwards of 100,000 people are thought to be planning a trip to the mountain, 30 miles west of Perpignan, in time for 21 December, and opportunistic entrepreneurs are shamelessly cashing in on the phenomenon. Per the Zetas, there is nothing special about this location, but due to its elevation it will afford safety during the Pole Shift sloshing and rise in sea level elevation in the Aftertime. ZetaTalk Comment 9/18/2010: Clearly Mount Bugarach along the border of France and Spain will be well above the waves after the rise in sea level to 675 feet and will survive all pole shift tides. As the highest mount in the area, and within the borders of France, the people of France could seek shelter there and because of the many myths associated with Bugarach undoubtedly will do so. Beyond that, there is nothing special about the spot as a pole shift refuge. Mountain building in Europe is no longer occurring but in the past for one rock layer to be shoved atop another was not uncommon. This often creates caverns and caves.